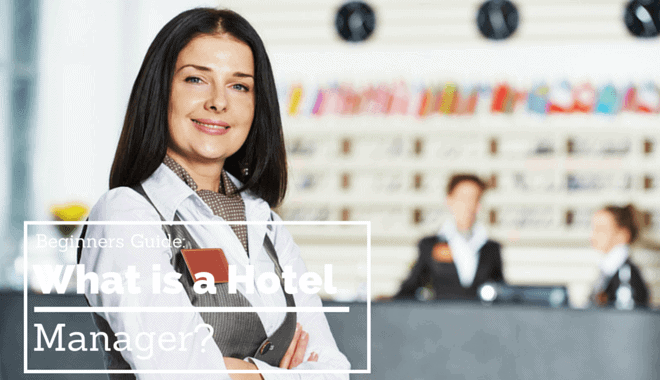 Beginner's Guide: What is a Hotel Manager? What is a Hotel Manager? The job of a hotel manager can best be described as an individual who is responsible for overseeing the operations of a resort, hotel, motel, or lodging facilities. Hotel managers are often referred to as hoteliers or lodging managers. An operations manager or general manager is responsible for ensuring that the day to day operations of the hotel run smoothly; however, there are also shift managers who act as general managers during certain shifts or specific hours. Larger hotel chains also employ district and regional managers who oversee all of the chain’s hotels within a district or region. Most people think that larger chain hotels are the only companies who employ hotel managers. While it is true that they do, there are a significant number of lodging companies and independently owned hotels who also hire hotel managers. Inns, resorts, and bed and breakfasts are just a few examples of businesses that require the services of a hotel manager to manage employee operations and ensure that guests are comfortable and satisfied. For example, Gatlinburg, Tennessee, a popular family vacation destination, has more than 50 independent lodging facilities that employ hotel managers. The knowledge and skills that you gain through a management degree program can also prove invaluable in other hospitality related fields, like managing a conference center. Hotel managers also meets with dissatisfied guests and make amends to ensure their comfort and happiness with their stay. They also manage any conflict that may arise between employees. A hotel manager creates weekly schedules for their employees, find substitutes for employees who call out sick, and hire new workers when needed. A hotel manager’s duties may also include tracking the hotel’s inventory for linens, housekeeping supplies, and supplies for the front desk. The average work schedule of a hotel manager can be brutal. Due to the fact that hotels run 24 hours a day, a hotel manager can expect to experience long shifts that include holidays, weekends, and late hours. The average workplace environment of a hotel is fast-paced, due to the constant interactions with other managers, employees, investors, and guests. Once a hotel manager begins to move into upper management, including senior managers and department heads, their schedule will begin to resemble a more traditional workday with some holidays and weekends off. According to the most recent statistics from the Bureau of Labor Statistics, the average annual salary for a hotel manager is $46,810 per annum, which equates to $22.50 an hour. Bear in mind that this is the median salary, so there will be a considerable difference between what the top 10% of hotel managers and the bottom 10% make. Other factors, such as overtime and holiday pay, will also affect how much a hotel manager makes each year. The training and background required for a hotel manager position will vary according to the specific management position, the size of the hotel, and the duties the job entails. Within the lodging industry, almost all management positions require industry experience as one of the basic qualifications. Although not always required, most employers strongly prefer that an applicant have a Bachelor’s degree in hospitality management or a closely related field. For a general manager or other upper management position, a graduate degree may be required, but this is not always the case. Industry tenure and industry experience can often be substituted for a lack of higher education. What Skills Should a Hotel Manager Have? In addition to education, a hotel manager must have a specific set of interpersonal skills. For example, while computer skills can be taught in a classroom, people skills cannot. People Skills – Guest concerns must be approached with patience, understanding, and tact, even under taxing circumstances; however, dealing with guests is only one component of a hotel manager’s duties. He or she must also be capable of motivating their employees, display leadership abilities, and demonstrate an ability to understand problems and resolve potential conflict. Communication Skills – Effective reading and comprehension skills are indispensable to a hotel manager. Hotel managers must write business letters, company reports, and problem-solving summaries. Excellent diction and grammar are crucial. Hotel managers are often required to give presentations to employees, guests, and business executives, so effective public communication skills are a must. Critical Thinking Skills – It is not uncommon to hear of a hotel manager being described as a professional troubleshooter. They work in fast-paced environments where they must devise practical and creative solutions to problems that may arise. In order to correctly interpret financial information, a hotel manager must have a working knowledge of math, and he or she must possess the ability to make decisions based upon a combination of their own professional experience and company reports. How Can I Become a Hotel Manager? The first step to becoming a hotel manager is to obtain a degree in hotel management or hospitality management. Accredited programs in the United States are required to offer an interactive, educational component that enables their students to work in a local hotel or other lodging facilities for a minimum of one semester. More than 20 states throughout the U.S. offer certification programs for those interested in working as a hotel manager.